Memory Care is a setting in assisted living communities or assisted living homes (care homes) with specialized care programs designed for people who have different forms of dementia such as Alzheimer's, Parkinson’s with dementia, cognitive deficits due to a stroke or other debilitating events, diseases or brain injuries. Costs for care in this setting can range from $4000 to $8000 per month depending on various factors including location, current availability, age of the building itself and the level of care assigned to each resident by the community’s nurse or manager. In the assisted living community setting, the memory care unit is a secured (locked) portion of the building or a secured (locked) free-standing building that is comprised of a select amount of private and/or shared apartments similar to regular assisted living apartments, but usually lacking the kitchenette for safety purposes. 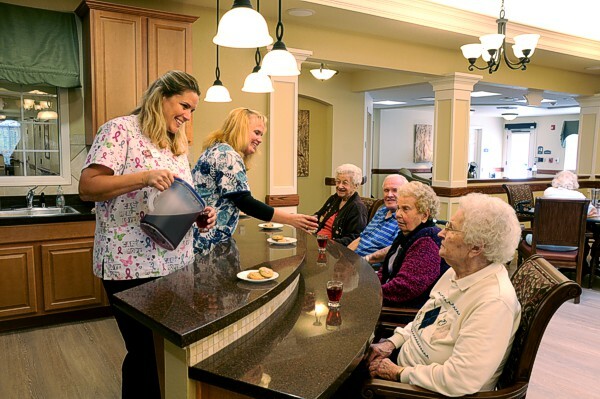 The apartments are arranged along shorter hallways than standard assisted living buildings commonly are and there are various activity areas and a smaller dining room as well as a much higher staffing ratio than in standard assisted living. Staffing ratios vary by community, but typically they try to keep the ratio close to 1 caregiver for every 6- 8 residents. Unfortunately, at night time, this ratio can change dramatically to be about 1 caregiver for every 15 or more residents, which can be a real problem for residents who are up and about during the night. It has become common practice among many (but not all) memory care units for such residents to be medicated to sleep during the night. Memory care units host a number of daily activity programs such as music therapy (sing alongs), movies, live presentations of special interest, gardening, arts and crafts, etc… and are usually somewhat active environments with enough open space for residents to roam around the halls and central areas as well as supervised and secured outdoor courtyard areas accessible during fair weather days. In the residential care home setting, memory care is comprised of a home that is secured (locked) with door alarms in place and usually anywhere between 4 to 10 bedrooms that can be arranged either as private rooms or shared (1 roommate) rooms depending on each resident’s needs and budget. less active than memory care units in the larger assisted living communities. It is important to note that any memory care setting is dramatically affected by the functioning level of the current resident population. If a place is absolutely lovely and well appointed with many well designed activity programs, but the current resident population is very low functioning (more advanced stages of dementia), then regardless of programming, the place is not going to have much activity going on. This type of setting would be wildly inappropriate for a resident who is very high functioning and requires a lot of mentally stimulating activity and social interaction. Likewise, if a place has a lot of high functioning residents, there will be a considerable amount of activity (and noise) during the day. Such a setting would be terribly overstimulating for a resident with advanced dementia who may become agitated or anxious in such an active setting. In Assisted Living, there are variables to the type of environments available. Today, we'll be discussing those variables and how they manifest in the daily life of residents who live in each type of environment starting with the least expensive option and ending with the most expensive option. 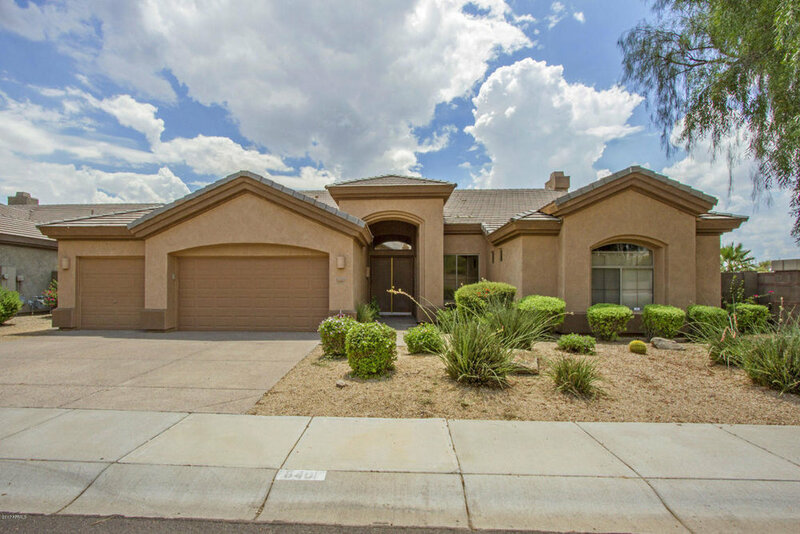 The majority of care homes that are licensed by the State of Arizona are usually licensed for five residents and may have either four or five bedrooms. Some residents may live in their own private room in the home or may share a room with a roommate at a lower monthly cost. The smaller care homes can range drastically in how they are designed, decorated, and managed. The current residents who live in the homes, along with their functioning level (both socially and physically) can vary as well. For the most part, the smaller care homes are quieter environments than the larger settings and can often have only one or two caregivers working the shift at any given time. Dinner is served “family style” in the dining room of the home and the caregiver/caregivers assist the residents who need assistance with feeding. Many times in these homes, if the current resident population is high functioning enough to participate in games, they will play cards, have book clubs, and socialization at the dining table throughout the course of the day. These centers, as they are referred to by the State of Arizona Dept. of Health Services Licensing Division, are licensed for 10 to 12 residents and are many times site built or dramatically redesigned to create larger and wider hallways, private bathrooms - many with roll-in showers in each or almost each bedroom. There is most often only one resident per room (private room as opposed to shared room) in these homes, but many of the homes do offer shared room options when they have the option of a compatible roommate who also needs to live in a shared room. Many people who have advancing dementia feel safer in a roommate situation because as their dementia progresses, they feel anxiety if they are ever alone. It is not uncommon to see a physical therapist working with patients in the hallways of these larger assisted living homes. Home Health companies are able to provide services wherever a patient resides in the assisted living world, whether it be a smaller care home or a large facility. It is easier to provide physical therapy for gait training (walking) when there is a hallway that is large enough for the patient and the therapist to be working together while other residents and staff have room to walk around them in the hallway. Smaller care homes can utilize outdoor space when interior space is limited for such therapies. Some homes even offer a grand sized dining and living area, and perhaps a large outdoor courtyard area for outdoor activities: BBQs, gardening, sitting benches or walking paths. Staffing ratios in these homes are similar to the ratio in the care homes, and can be that of two to six caregivers for every 10-12 residents, depending on the care needs of the current population in the home. 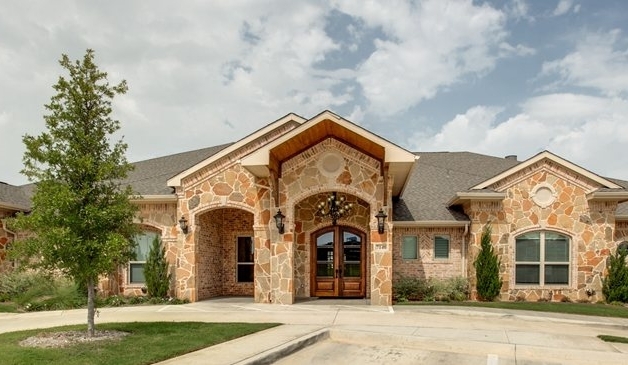 These homes offer a happy medium between the very quiet setting of a smaller care home, while also incorporating the more active environment of a large assisted living community/facility. The largest of the assisted living options is the facility or community setting. These facilities can range in size up to hundreds of apartments in one building or in multiple buildings on one campus. Instead of residents having a room, they have an apartment equipped with their own bathroom and kitchenette. Meals are served in the main dining room, which may require ambulating from the apartment down a hallway and to the elevator if the dining room is on a different floor than the resident’s apartment, but staff is provided to assist residents to and from the dining room for meals or social activities. This setting can be a good option for higher functioning residents who do not have heavy care needs that require more one on one attention than a larger corporate environment can offer. Caregiver ratios in the facilities can range between 1 caregiver for every 15 - 24 residents and staff is required to check on each resident in their apartments at least every 2 hours. Residents are furnished with an emergency call system to alert staff when they need assistance. Some people feel more comfortable in the larger setting of a facility, while others may feel overwhelmed by the presence of so much activity and so many people at all times. Be sure to tune in next week as we will post our blog discussing Memory Care options. In Arizona, our Medicaid benefit has been contracted out to two insurance plan administrators, which are Banner University and United Healthcare. These two networks are the only options available in 2018 for anyone applying for benefits through ALTCS. In order to apply for ALTCS, a person must either contact them directly at 602-417-6600 or by utilizing the assistance of an ALTCS planning representative, which are usually employed within Elder Law firms. ALTCS income limit is $2250 for an individual and $4500 for a couple and assets such homes, cars, savings, stocks, bonds, etc… have limits as well. ALTCS also has a five-year look-back rule, in which they require documentation for the past five years about income and assets. ALTCS determines which plan administrator (which network) the eligible applicant will be placed into once they reach the pending status in their application process. For this reason, it is very important to ask the ALTCS case manager for a list of homes and facilities that are currently contracted with that network of ALTCS because the State of Arizona Dept. of Health Services does not post such a list on their website. There are thousands of assisted living homes and over 280 assisted living centers in the Phoenix metropolitan area and it would be nearly impossible keep track of which ones have current ALTCS contracts and with which networks. It is advised to ask for a list of currently contracted homes or centers in specific zip code areas within the network you are pending in from your ALTCS case manager. ALTCS only pays for a shared room or shared suite in an assisted living home or community. This means that the ALTCS recipient will have a roommate. Homes and centers always try to pair roommates to the best compatibility option available. Even though an assisted living facility may be listed as accepting ALTCS, most of them have a private pay requirement period that can be anywhere from six months to two years. These are corporate owned centers that have allowed for a few ALTCS beds in order to give their current residents the option of staying once their personal funding sources run out or for new residents to know that they can move in and do a spend down of their private funds and eventually “roll” to ALTCS after their funds are dissolved. Some assisted living homes will take a person who is ALTCS pending and allow them to pay a reduced rate out of pocket until ALTCS is approved, but only ALTCS has a list of current homes that are contracted with the network that ALTCS plans to place the applicant on. This list can be obtained by requesting it from the ALTCS case manager. The lower end of the cost range for a shared room in an assisted living home is between $2300 - $2800 per month for a private pay resident. Keep in mind that in 2018, the minimum wage in Arizona is $10.50 per hour. Banner University pays the homes $66 per day ($1980 per month), which equates to $2.75 per hour for 24 hours of care. Level ONE pays $67 per day ($2010 per month), which equates to $2.79 per hour. Assisted living placement agencies are not legally allowed to collect a placement fee out of ALTCS funds. Since ALTCS does retro-activate payment on many cases back to the date of move-in to the assisted living environment, a fee that is paid to a placement agency on an ALTCS pending case could potentially run the risk of being in contempt of the law. For this reason, we are unable to assist in placement services for anyone who has either already applied for ALTCS or is planning to apply within 6 months of contacting us. If you need to contact ALTCS, they can be reached directly at 602-417-6600 or you may contact an Elder Law firm who specializes in assisting ALTCS applicants through the process for a fee. Adult Care Connection has been helping families navigate their way through the process of selecting the appropriate settings in Assisted Living for over 21 years. Our highly skilled staff is comprised of medical social workers, with several years of extensive experience in working with the aging and disabled population. Every day, we answer questions about assisted living when discussing cases with our clients and professional referral sources. We would like to share some of the that information with you in our first blog series, #AssistedLivingBasics. Although assisted living is not easily paid for out of personal funds, it is the most affordable option available for the long term care of a loved one when family members are unable to provide the care their loved one needs on a continuous basis (24 hour care). $3500 - $8000 per month for private room. Average rate $5000 - $6000. $3000 - $6000 per month for shared suite (roommate). Average rate $4000. $3500 - $6000 for a private room. Average rate $4500 - $5000. $2500 - $3500 for a semi-private (shared) room. Average rate $3000. The rate of employee minimum wage was raised to $10.50 per hour in 2018 in the state of Arizona. At the starting rate of $2500 per month for a shared room in a residential care home (lowest option available in assisted living) for 24 hour care, which includes meals, laundry service, medication management, etc… it works out to be $83.33 per day, which is $3.47 per hour. Hiring a caregiver through a home care company/agency is about $25.00/hour on average in Arizona in 2018. This works out to be $600.00 per day, which is $18,000 per month for 24 hours of private duty care daily in the patient’s own home. Then there is the cost of meals, laundry, etc. to factor in. Most medication management is provided by a nurse from a home health company/agency and can range in cost widely, depending on various factors. When families or individuals are not able to pay for the costs of assisted living, they can apply for Arizona’s form of Medicaid, which is called: Arizona Long Term Care System, or ALTCS, pronounced “All-Tex”. There are maximum allowable income and asset requirements as well as medical condition requirements which are reviewed by the State of Arizona prior to anyone being approved to receive benefits. Next week, we will be discussing those parameters in further detail, so be sure to tune in to #AssistedLivingBasics which will be available on Monday, March 26th, 2018.